I've previously disclosed my obsession with magazines. But this is the one. The one I would have delivered to that desert island where Matt Damon and I enjoy an unlimited supply of Cheez-its. Real Simple is smart and clever and helpful and stylish and doesn't make me feel like an underachiever (cough*MarthaStewartLiving*cough). Plus, it's the only subscription for which I'll pay full price. A sign of affection for sure. Tina Fey live is always my preference. Whether being interviewed or delivering an acceptance speech or embodying the spirit of one rogue governor. So I had high hopes for this week's live 30 Rock and it did not disappoint. I've embedded the West Coast version because I really think they got the better episode. Dumb California with their mountains and beaches and In-N-Out. I've declared my music crush on Brooke Fraser. At least 5 times. Her newest album, Flags, is different from her 2 previous outings, but still quite delightful. If I might recommend my favorites from the embedded player, please fast forward to #3 Orphans, Kingdoms and #11 Flags. But I'm not the boss of you. You do what you want. Recommending Disclaimer: I don't suggest anything because I get it free or because I have some sort of illicit relationship with an editor or writer or New Zealand singer. I save all of those questionable dealings for those who offer me Reese's Cup pumpkins. I haven't seen the West Coast version yet, but I was honestly a little let down by the episode. Maybe my expectations were too high. Maybe I'm still hung up on the awesome-ness that is Tracey Jordan riding in Cash Cub. K: I would agree with you on the Cash Cab - fab. I really tried to compare it to the live Will and Grace and I thought it was 100% better. It's a tough gig no matter how you spin it! Are you going to see Brooke on Nov 13th at Work Play? All the cool people will be there. 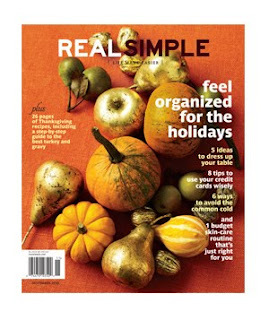 Love Real Simple....and yes, M.S. makes me feel more of a slacker than I already am (if that is even possible). I just read your ladybug post, and I really, really want to laugh (I can just imagine you telling the story), but a broken arm AND a broken foot....OUCH! MD: But of course!!! Kara and I are coming!